A missal provides all the prayers, hymns, and readings necessary for the celebration of Mass over the course of the year. This deluxe 15th-century missal made for use on the altar was given to the church of St Lawrence in London by William Melreth, alderman, textile merchant of Broad Street and eventually member of Parliament, probably just before he served as Sheriff of London. 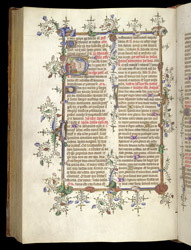 The date of a church's dedication was an important feast day, with specially assigned readings from the Bible and prayers, as presented on this page. Instructions and titles are written in read, prayers and readings in black. The prayers begin with a picture within the first letter showing a bishop outside a church. He is about to sprinkle the church with holy water to cleanse it spiritually and to bless it. Lower in the same column, the title for a reading from the Book of Revelations or Apocalypse can be seen.